The new Xenon-Emerald 2.8/28 joins the existing Xenon-Emerald 2.2/50 and 2.8/100 lenses. The 28mm lens offers an aperture of 2.8. 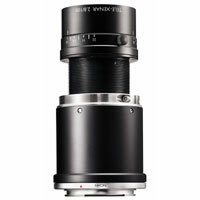 It is available in two versions, with working distances from infinity to 550mm, or from 900mm to 400mm. The aperture and focus of this compact and sturdy industry-ready lens can be securely locked. The lens is designed for universal use with cameras using line scan or area scan sensors, with or without micro lenses. The optical design is targeted for use in the visual and near-infrared wavelengths, from 400 to 1000 nm. The optical coating of the individual lenses is optimized for the 400 to 700 nm or 700 to 1000 nm wavelengths to give the best possible transmission in these ranges. Industrial applications include machine vision, inspection, traffic and medical systems.